This one took a month to finish because knitting the first sleeve in one day proved to be too much for my left hand, which resulted in a two-week break from hand-knitting. The cardigan was actually completely finished and ready to wear yesterday but the gray skies outside were not conducive to taking decent pictures. I really liked my Jewel cardigan so I used the same pattern, with only a few changes. 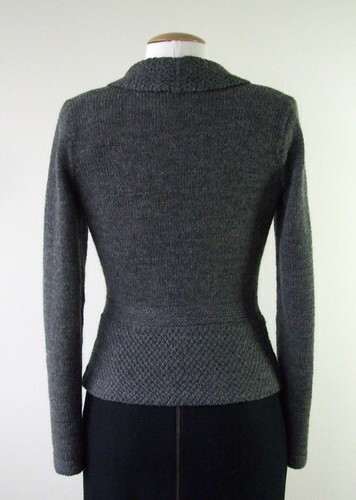 I wanted the back more fitted at the waist – I decreased the peplum by eight stitches where back darts would usually be and then recalculated the side increases to add the eight stitches back. I am very happy with how this sweater turned out. I’m thinking about making it in multiple colors. 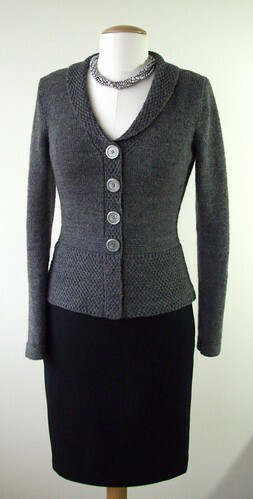 One additional change I would make on future cardigans is move the buttonholes in by a stitch or two. I think it would be prettier to have more of the edge showing. That’s a beautiful sweater. I would love to be able to knit so professionally. This sweater is gorgeous. I’m trying to teach myself to knit, and you’ve just provided me with an amazing inspiration. That is absolutely gorgeous! Like Sandy, I am also a fledgling knitter…this gives me something to aspire to.